LOS ANGELES — In the end, a team that spent all season dealing with — but never solving — their fourth-quarter woes was done in by it. The Celtics fell short in their quest for NBA title No. 18 last night at Staples Center because they couldn’t finish off the Lakers. They watched a 3-point lead with 6:29 left suddenly turn into a 6-point deficit. The Celtics played a brilliant game up to that point, and needed a series of big plays to polish off a masterpiece. Instead, they missed shots, looked confused on offense, and were beaten to rebounds that set up free throw opportunities. They desperately tried holding onto the lead, desperately tried coming back, and then ran out of time. The 83-79 loss will go down as one of the most competitive and fiercest Game 7s in NBA history, but Celtics will take the excruciatingly long flight home realizing they were chased from behind and caught, passed because they ran out of gas. Phil Jackson was right when he preached to his team during the waning moments of Game 5 that the Celtics are good at blowing fourth-quarter leads. They spent all season winning despite blowing leads and even during the playoffs, the Celtics often slipped down the stretch. Last night they were dashing toward the finish line to the Larry O’Brien Trophy but tripped and fell, wasting perhaps their final opportunity to win a championship with this crew. It’s unrealistic to believe the Celtics will return completely intact. They have seven free agents on the roster, including Ray Allen. And coach Doc Rivers devised a sparkling game plan to squeeze one more run out of a championship-caliber basketball team and it nearly worked. The game came down to several big plays in the final six minutes. Derek Fisher took advantage of a double team on Pau Gasol and drained a 3-pointer to tie the game at 64. That began a 15-4 run that spread through more than four minutes. 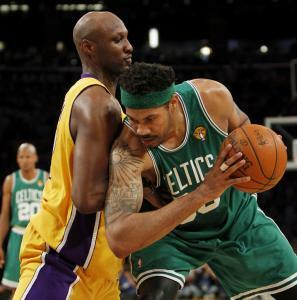 The Celtics struggled with scoring as Jackson sent two defenders at Paul Pierce, forcing Boston to rush its offense. One time the Celtics took advantage was when Kevin Garnett dunked a pass from Rasheed Wallace with 3:11 left to cut the deficit to 3. The ball movement then stopped and the Lakers responded with big plays. And so did a whopping 21 Lakers free throws in the fourth quarter. The Celtics were whistled for 12 fouls, seven more than the Lakers, in the final 12 minutes and eight of Kobe Bryant’s 10 series-MVP-clinching fourth-quarter points were scored at the free throw line. While the Celtics blamed themselves and the Lakers’ execution down the stretch for the collapse, one Celtic in particular had an issue with the officiating. After the game, Wallace, sporting a white T-shirt with his sneakers and headphones resting on the floor beside him, stood outside the officials’ locker room waiting to speak with Dan Crawford. Wallace fouled out in that pivotal fourth quarter. He attempted to take a charge on Bryant after Gasol chased down an offensive rebound. Earlier, he was called for a loose ball foul on Gasol. Of course Wallace disagreed with both calls and the free throw disparity was not lost on Rivers. Yet the fourth-quarter blame has to rest solely on the Big Three. 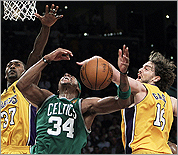 Pierce missed four of his five shots, Allen never found his rhythm, and Garnett finished with one rebound. Those numbers should pain Rivers more than free throws. When it counted, his beloved veterans were fried, unable to match the clutch performances of their opponents. That has been their issue all season and they nearly camouflaged it long enough to seize glory. Instead, they will be forced to regret their late-game failures until they have chance to atone, and that could be a long, long time. Gary Washburn can be reached at gwashburn@globe.com.